Orthodontic treatment is a longer process than most typical dental procedures. It can last months or years. When you have new braces, you’ll have to make adjustments to take proper care of them to help ensure your treatment doesn’t have any delays or problems. 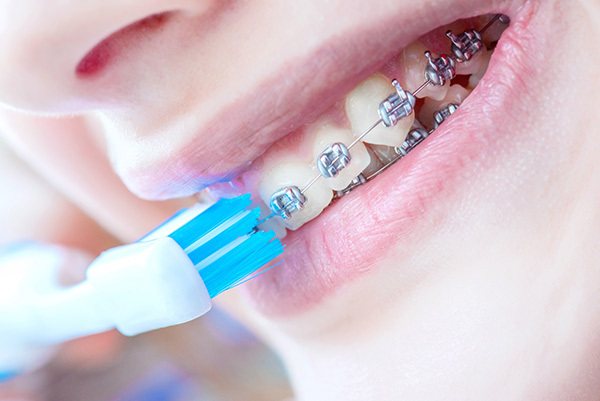 Taking care of braces isn’t too difficult – as long as you know what you can and can’t do! Read on to learn tips for taking care of braces and what to do if you run into a problem. 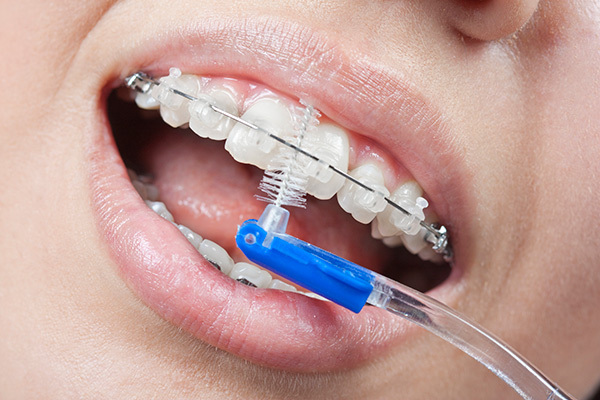 The most important part of taking care of braces is to continue your standard dental care routine. Depending on the type of braces you have, their impact on how you practice oral hygiene will be different. There’s never an excuse to skip brushing your teeth. It’s the only reliable way to keep bacteria and plaque from wearing away at the surface, which creates cavities and long-term dental health issues. When you have braces, brushing can feel a bit different! You need to brush around the brackets to ensure the bristles clean every surface, including around the brackets. They can trap food particles just as tightly as the spaces between your teeth. While brushing is largely the same, braces can make flossing feel impossible. Don’t worry – it’s typical to have difficulty with flossing when you’re new to braces! However, you still need to floss to avoid cavities and gum disease. The more you floss, the better you’ll get at maneuvering around your wires. One way to make flossing easier is to purchase a floss threader. This special flossing tool will help you clean hard-to-reach spaces under your archwire. Taking care of your braces does mean you’ll need to forego some types of foods. Hard foods like crunchy candy or nuts can damage the wires or brackets of your braces. If this happens, you’ll need to go back to your orthodontist to have them corrected. Even some healthy food options can be problematic. Carrots or apples have textures that aren’t braces-friendly. However, if you cut them into smaller pieces, you can often eat them without any trouble. If you have a craving for sweets, don’t worry! Chocolate is a great option for those wearing braces. It’s soft and drinking water afterwards can wash away a lot of the residue left behind. Of course, you still need to brush to completely remove the sugars from your teeth. Otherwise you’ll be back to your dentist with cavities to fill! As your orthodontic treatment continues, it’s possible that you may experience a damaged wire, loose bracket or other technical issue. The first thing to remember is not to panic! While this small damage to your braces need to be corrected as soon as possible, it won’t set back your treatment or put your health at risk. If a broken wire is sticking into your mouth and causing you pain, you can take some steps to mitigate the issue. First, try to use a soft object, like the eraser on a pencil, to push the wire into a position that doesn’t irritate your mouth. If that won’t work, use orthodontic wax to cover the wire where it’s poking you. Using Invisalign? Don’t Lose Them! You won’t have to worry about taking care of braces wires or brackets if you’re using Invisalign, but you still need to be careful! Invisalign uniquely gives you time each day where you aren’t wearing your aligners – typically to eat and brush your teeth. You also have multiple sets of aligners that you need to progress through during your treatment. But this introduces a unique problem as well: you could lose them! It’s not as easy as asking your orthodontist for a replacement, either. While you do need to speak with your orthodontist, they’ll need to order a replacement for you, which could set your treatment back a bit. Don’t try to skip ahead to the next aligner tray, either! While your orthodontist may recommend this if you were close to transitioning to the next aligner, you shouldn’t make this decision alone. It’s likely that the aligner won’t fit properly because the one you lost hadn’t finished its job yet. Interproximal brushes, or interdental brushes, are used to help clear away food debris and bacteria between your teeth. Like floss, these thin brushes reach where typical toothbrush bristles can’t. For those wearing traditional braces with wires, these brushes are perfect for cleaning tough to reach spaces. They also help you clean behind your wires! If you use an electric toothbrush, you can likely find an interproximal brush head that’s compatible. Water flossers like Waterpik are another fantastic supplement to your dental care routine. While water flossers don’t necessarily replace flossing, they can also help you clean areas of your mouth that you can’t quite reach with string floss. One additional advantage of water flossers is that they can help clear away bacteria in the pockets where your gums and your teeth meet. This unique benefit makes them a great addition to daily brushing and flossing. Fluoride offers additional protection against bacteria and plaque for anyone. Because braces can create more hiding places for bacteria, increasing your possibility of plaque development, fluoride becomes even more helpful to keep your teeth and braces clean. Dr. Andy can make recommendations about fluoride to use. If you’re concerned about your dental health during your treatment, remember to ask at your next visit! Stay connected with Doctor Andy on Social Media! This entry was posted in Braces, Oral Health Tips, Orthodontic Tips and tagged Braces, dental care, new braces. Bookmark the permalink. Follow any comments here with the RSS feed for this post. Both comments and trackbacks are currently closed.